NASA is fundamentally overhauling its Mars exploration strategy, ditching multibillion-dollar "flagship" missions in favor of cheaper, more efficient projects for now, agency officials announced Monday (Feb. 13). The decision is a response to diminished funding for robotic exploration going forward. In his federal budget request for next year, which was revealed Monday (Feb. 13), President Barack Obama allocated $1.2 billion to NASA's planetary science programs — a 20 percent cut from the current allotment of $1.5 billion, with further reductions expected over the next several years. The cut is spurring a shift in NASA thinking about the best way to study Mars in the near term. 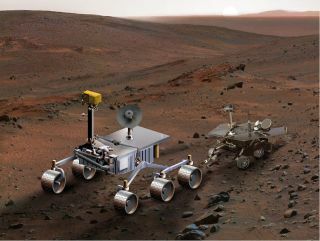 This shift compels the agency to withdraw from the European-led ExoMars missions, which aim to launch an orbiter and a drill-toting rover to the Red Planet in 2016 and 2018, respectively. The new direction does not imperil NASA's $2.5 billion Mars Science Laboratory (MSL) mission, which will drop the 1-ton Curiosity rover onto the Martian surface this August to investigate if the Red Planet can, or ever did, support microbial life. Nor does it affect the $485 million MAVEN mission, due to launch in late 2013 to study Mars' upper atmosphere and gather information about how the Red Planet's climate has changed over time. However, NASA's new strategy acknowledges that the agency won't be launching ambitious, expensive "flagship" missions like MSL toward the Red Planet — or any other solar system body — anytime soon. "A flagship mission in not on the table," said John Grunsfeld, NASA's associate administrator for science. "We're looking at building a moderate mission, and it's a partnership looking at synergies between the requirements of human spaceflight, science and the needs to demonstrate technologies that advance other missions in the future." It makes sense to set up such partnerships, beyond simply spreading costs around the various branches of NASA, agency officials said. NASA has both science and exploration goals at Mars, after all; Obama has tasked the agency with getting humans to the Red Planet by the mid-2030s. Bolden said details of the new Mars strategy should be worked out in a matter of months. The goal is to be ready to launch a mission by 2018 and/or 2020, to take advantage of favorable alignments between Earth and the Red Planet. "We are looking at a basic mission for 2018," Grunsfeld said. "I'm not a betting person, but I'd certainly plan on it." He added that such a "basic mission" might cost somewhere between the $485 million MAVEN and NASA's $720 million Mars Reconnaissance Orbiter, which launched in 2005 and is still studying the Red Planet from above. NASA's scaled-back Mars strategy puts on hold any plans for a sample-return mission, which would certainly fall in the "flagship" category. This is bad news for astrobiologists, many of whom believe that sending a piece of the Red Planet back to Earth for study is the best way to assess Mars' habitability, and to search for signs of Martian life. However, scientists shouldn't give up hopes for a sample-return effort, Grunsfeld said. He is optimistic that careful planning — and rosier budget outlooks in the future — will one day give researchers on Earth a chance to study Martian rocks and soil up close. "We're all folks who dream about science, dream about future science, dream about exploration, dream about Mars," Grunsfeld said. "I would certainly hope that, within 20 years, we have our first carefully selected samples of Mars back here near Earth or on Earth, in laboratories where we really can do the tough work to understand the climate conditions on past Mars, current Mars and the possibility that life might have existed there once."